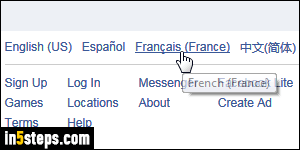 You get to pick your preferred language when you first sign up with Facebook. But that setting can be changed after the fact. And, actually, changing Facebook's language, or the language used in any app you know well and use regularly, is a great passive way to pick up a new language! 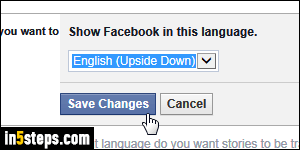 I'll also show you how to change the language into which Facebook translates foreign posts and comments (it uses Microsoft's Bing Translation service behind-the-scenes). 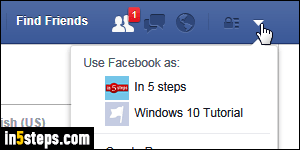 First, log into your Facebook account. 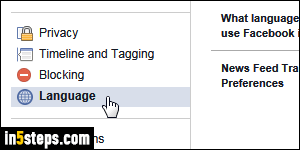 Then, click on the dropdown arrow near the top right corner of the page, and select "Settings" from the menu. Now select the Language options on the left. 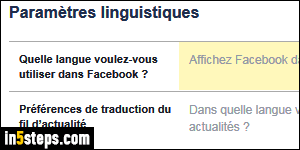 The first setting ("What language do you want to use Facebook in?") controls the "user interface" - everything you see on screen, except for user-generated content. The name of the commands inside the menu you just clicked on, for example, would use that language. Click on the language name or the Edit link on its right, and pick another language or dialect. Notice that regional variations are included for most languages (including fantasist variations like English Upside Down or English Pirate!) The name of each language is written in its own tongue, making it easy to find yours if someone changed it as an joke. Click Save Changes to apply. Here's more: "What language do you want stories to be translated into?" can translate content automatically or on demand. Note that this language setting doesn't have to match your main language (but it does by default). 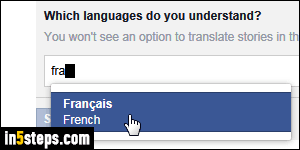 You can tell Facebook which languages you understand, so that it doesn't offer to translate those. And finally, you can explicitly pick "Which languages do you not want automatically translated?" These last two are relatively new options.